San Antonio Missions: Mission Concepcion, Mission San Jose, Mission San Juan, Mission Espada. Remember the Alamo? Well, put that idea aside for a moment because if visiting that veteran icon of the downtown San Antonio area is on your itinerary, there are several other historical and captivating missions to enjoy than just that singular totem of tourism. 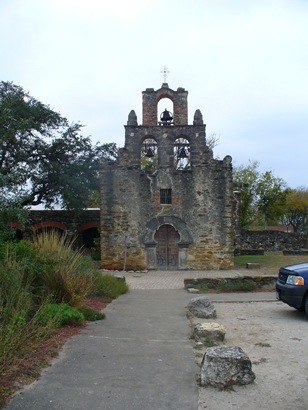 Beginning two and a half miles south of downtown San Antonio there are four eighteenth century missions along what the National Parks Service refers to as the “Mission Trail”. This route will lead you on an afternoon’s journey through some of this country’s few, yet greatest, antiquities. Recently, my wife and I toured these demi-cathedrals and were amazed at the relative seclusion and magnitude of the relics. 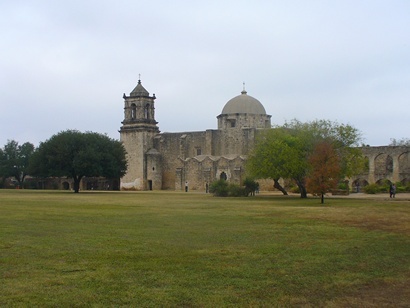 Like most of the missions south of San Antonio, the mission Nuestra Señora de la Concepción, usually, simply Concepción, was relocated to south Texas from east Texas in 1731 to escape the threat of the encroaching French soldiers from Louisiana. The mission’s sacristy is a wonderful design of beauty and purpose, its twin bell towers (perhaps symbolizing the incorporation of two distinctly different cultures occupying the same site) framing a single, central entranceway to the church’s nave. Due to its proximity to the city’s center, the mostly-extant condition of the building and the fact that this mission is still exhibiting some of the original fresco decoration, this presidio draws many visitors. Once inside you will notice that the frescos are sketched over in pencil by a new hand; a necessary step before the actual restoration begins next year. These frescos illustrate an interesting duality of both Catholic and Indian doctrine- a rare example of the Franciscan friar’s attempts to indoctrinate the indigenous population into the faith without the prototypical heavy-handedness. When visiting for the first time you might consider that the amount of space the mission’s sites occupy is unusually large and spread. 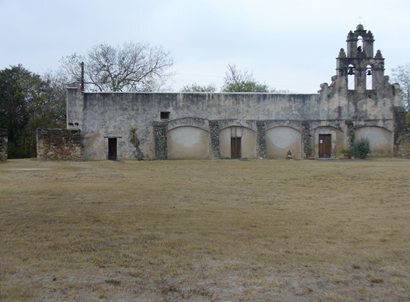 That is until you realize that, when in operation, the mission’s purpose was to house the Spanish friars and soldiers as well as some of the local population of Coahuiltecans Indians. The acreage afforded the area necessary for worship, housing, gardens, workshops, granaries and even cemeteries. The land, although initially open, is bordered with the remnants of stone walls, protection from the hostilities of the Apache and Comanche Indians. The Alamo also exhibited a similar construction. However, unlike these other missions, much of the expanse that was the Alamo’s has been overrun by the aggression of parking lots, hotels, restaurants and office buildings. A little farther south on ‘Mission Road’ is the mission of San José y San Miguel de Aguayo. Due to its stunning architecture and relative opulence, San José was termed the “Queen of the Missions” even 270 years ago. Because the site has maintained its structural integrity and appears today much the same as it did then, the moniker remains appropriate. For the same reasons the number of tourists at this site is greater than the others. We found that we had to wait longer for photograph opportunities at San José. We also experienced that many of the visitors were involved in the same expedition as ourselves; we kept seeing the same faces as we passed from one mission to the next. In fact, at three of the four missions, I had to wait for the same woman to pass my camera’s frame before I could get a shot of the churches facades. The third presidio on the ‘Trail’ is the Mission San Juan Capistrano. Originally commissioned in 1716, again in the woods of east Texas, this mission was reestablished to its current position in 1731. Sparse and somewhat remote, this presidio more resembles an architectural site than its relatives. 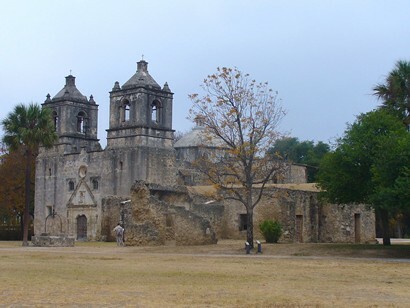 The church’s tower stands atop a thin, mostly reconstructed wall and is crowned by a trinity of bells, which give this mission a markedly different appearance than Concepción or San José. There is a fragility here that suggests a degree of spartanism. However, the reality was that the land within and surrounding this mission was so fertile, due in no small part to the fifteen miles of aqueduct meandering throughout the countryside, that the mission frequently had surplus food with which to supply the neighboring churches and communities. Sadly, on the day that we visited, the church’s nave was closed. A sign on the wooden door read that the sacristy was closed “because of thefts and vandalism,” the inevitable and sorrowful indicator of modernity. The fourth and final mission along the route, San Francisco de la Espada, also had its beginnings in east Texas. Unlike its sister communities, Espada dates to the seventeenth century; the initial founding in 1690 makes it the oldest of the missions. The facade is remarkably well preserved and, like San Juan, also displays a triangle of bells above the original doorway. The courtyard here was radiating with fresh flowers in full bloom even in mid-November. One area of walkway was closed to the public and soft ecclesiastical music could be heard humming from an outdoor speaker system. We asked whether there might still have been an active convent on the premises and the docent answered that no, the convento, or, priest’s quarters, had closed almost a century earlier. Concerning the maintenance of the flowers, bird feeders and a couple of healthy-looking cats we were told that one of the Franciscan brothers “hangs out here on a regular basis.” All told, the mission is tranquil, beautiful and still exhales a whisper of intent to convert. As a group, these four missions along the “Mission Trail” are extraordinary. Overlooked by some and unknown to many, an afternoon spent in their discovery is well worth the effort. So, don’t forget the Alamo, just remember these other astounding monuments of our culture and history.